Has your FIOS or other internet box started beeping? The internet box that is usually just inside the house is called an Optical Network Terminal (ONT). (Note that the ONT plugs into another box with an antenna. This is the router.) The ONT has a Battery Backup Unit (BBU) since you need to have the ability to make 911 phone calls in the event of a power outage. But the rechargeable batteries usually just last 2-3 years. Instead of having Verizon or your internet provider replace the battery, you can usually do so yourself if you’re comfortable opening the ONT and unplugging the battery. Replacement batteries are available at places like Amazon, BatteryMart, and Mighty Max Battery. They typically cost $30-50. 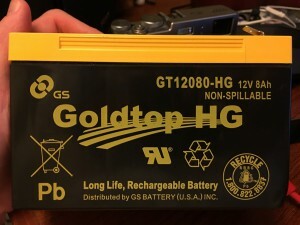 For my Verizon FIOS ONT, I had to purchase a battery that was comparable with the Goldtop HG GT12080-HG. The key things to look at are the terminal connection type, volts, and amps. My model has F2 terminals, 12 volts, and 8Ah. You also want to make sure the dimensions fit or that the battery claims to be a direct replacement for your model.